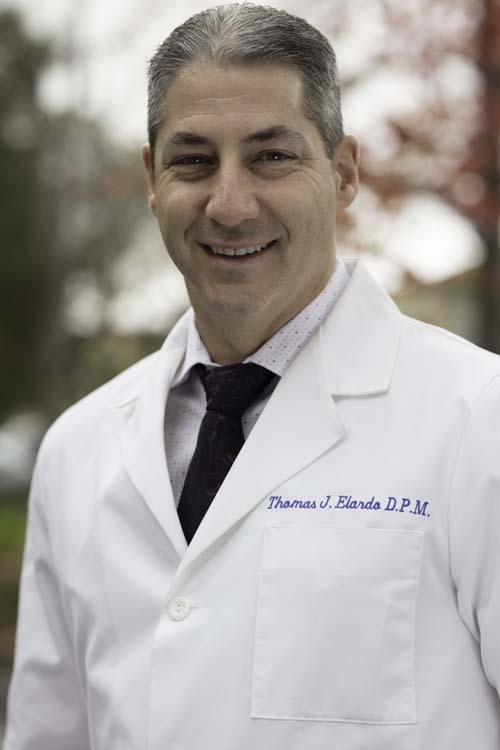 Dr. Elardo was born and raised in New Jersey. After finishing his high school career as State Gymnastics Champion, he earned an Athletic Scholarship to compete in Gymnastics at San Jose State University. During his tenure at SJSU, he competed as a Division I Gymnast earning multiple awards including the prestigious Clair Jennet award for outstanding scholar athlete. Dr. Elardo received his undergraduate degree from San Jose State University earning a Bachelors of Science in Systems Physiology with a minor in Chemistry. After taking a year off he then entered his postgraduate studies at the California College of Podiatric Medicine in San Francisco, receiving his doctorate in 1996. A surgical residency then followed at the Veterans Hospital in Palo Alto and Stanford Health Services. Dr. Elardo started in private practice in Los Gatos, close to Good Samaritan Hospital. He has been a role model and leader in the Podiatric profession, involved in his local, state and national societies. He has also served as Secretary, Vice President and President of the Santa Clara Podiatric Medical Society for multiple terms. He now serves on the Credentials board for Medical Dimensions Incorporated and Columbia Good Samaritan Hospital. He is currently overseeing the surgical residency affiliation with the Veterans hospital in Palo Alto. His current interests include general Podiatry with a sports medicine focus. He is board certified by the American Board of Podiatric Surgery and is a Fellow of the American College of Foot and Ankle Surgeons. Dr. Elardo lives in the Almaden area of San Jose with his wife and 3 daughters. He enjoys playing softball, skiing, and going to Hawaii.